Looking for Virginia fishing hot spots, look no further than Reedville. Located on the Chesapeake Bay, it's an angler fisherman's paradise. 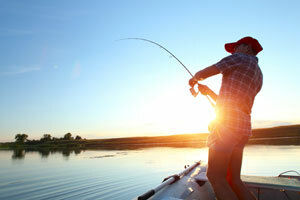 There is no better place to launch your boat and head out to the waters teeming with fish. You'll have your choice of accommodating marinas, and can easily have access to all the helpful hints and information online that'll make your excursion that much more successful. Several fishing reports are available for the port of Reedville VA. Plan your next getaway here, and don't forget to reserve a room at our Bay Motel Virginia. Call today. Reedville was established in the 1800s as none other than a fishing town. Its economy is driven, to this day, by the fishing industry. Well, neither of these could be possible if the waters had no fish, or even a sub-par amount of them. In view of this, why would you want to be anywhere else? Some of the more popular types of fish that inhabit these waters include Weakfish, Atlantic Croaker, Striped Bass, and Bluefish. Of course, those can range from season to season, in addition to the most bustling marinas. It's always a good idea to check online reports to give you an insider look. The sooner you know where and when to go, the more time you'll have to cast. Likewise, the closer your motel is to your fishing destination, the more time you'll have, also. This is why Bay Motel is the place for you. We offer accommodations suitable for any fisherman looking to spend their days on the boat, and simply get a good night's sleep to do it all over again the next day. Call us today to make a reservation for your next excursion at one of Virginia's fishing hot spots.